Use meaningful measures. “O2 and CO2 coverage” are not units of measurement. Outside carbon dioxide levels is not necessarily a relevant measure. Particulate matter is often used as a measure of air pollution. Explain the analysis. It appears the coverage is mapped by simply drawing buffers around parcels, not by any scientific measure. Parks don’t produce plumes of oxygen; industrial areas don’t produce plumes of carbon dioxide. It’s unclear how the size of the buffer was set. Validate your assumptions. The authors assume that parcel size corresponds to intensity of use. Absent other evidence, there’s no indication that is accurate. For example, the Packard Plant, which is zoned industrial, has been unused for decades. It probably does produce a lot of pollution from scrappers’ fires, though, maybe even more so than larger nearby active industrial areas, which are often regulated. Make sure colors are relevant and high-contrast. It is hard to distinguish schools near industry (dark blue) from industrial parcels (shades of purple). Hamtramck and Highland Park are uncovered on the map. 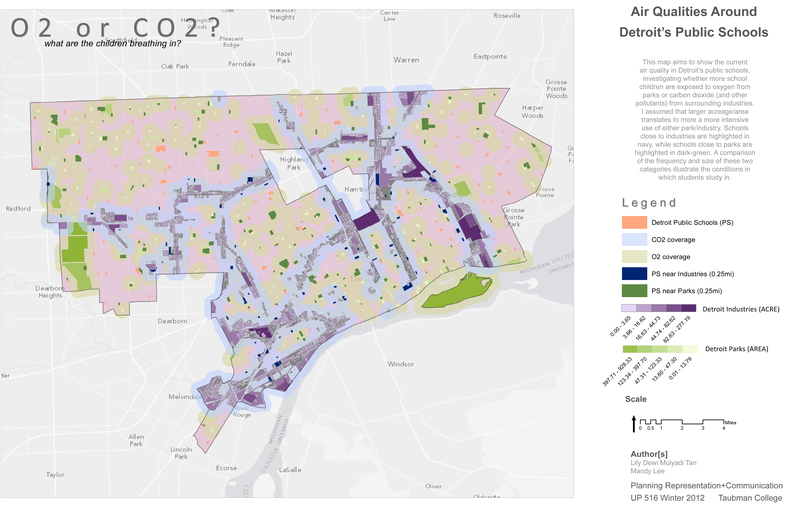 (We should start a library of maps missing the middle of Detroit). A map may not be the best way to show the data. The authors write, “A comparison of the frequency and size of these two categories illustrate the conditions in which students study in.” A better description might be a chart or table that lists student population near parks, near industry, or both. This would be more actionable — interested parties can focus on the locations that have the most students. Adding grades might help even more by identifying younger students who might be at more risk. Cite your sources. The data sources are not listed here. 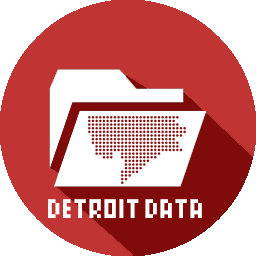 Detroit Public Schools has closed or transitioned dozens of schools in the past decade, and we can’t tell from the map how old the data is.